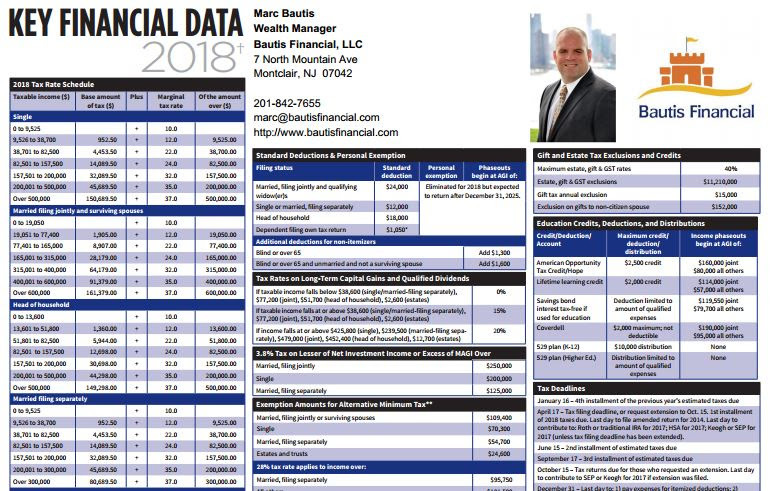 In light of the recent Tax Cuts and Jobs Act, I wanted to send a quick, easy-to-follow reference card with the new tax brackets and other numbers that investors need on taxes, Social Security, healthcare, Medicare, retirement, college planning and more. The guide presents these numbers in simple calculation tables to help you estimate and manage your tax bill. The tables also have information that can help you make more informed decisions about your investments and retirement savings. Naturally, you can always call me when you have questions or concerns or want to dig deeper into the numbers, but this simple tool is convenient for checking an assumption or marshaling your facts.